Get your spring play t-shirts at The Loft Store. Please order by Friday, March 30th. Act One Scene 2: Page 20 at Argante’s entrance to page 31 before song. Act One Scene 4: Sylvestro’s entrance on page 48 to end of Act One. Act Two Scene 1: Top of Act (pg 60) to page 67 before Geronte enters. Act Two Scene 2: page 67 (Geronte’s entrance) to page 72 before Zerbinetta enters. Act Two scene 3: Page 72 (Zerbinettas entrance) to end. REHEARSALS WILL BE IN THE BLACK BOX UNTIL AFTER STARS. THEN WE WILL GO TO THE STAGE. Thank you to each and every one of you who auditioned for Scapino!. We so admire your bravery and hard work; you made this a difficult task for us all, especially with so few roles available. All cast please meet in the black box theatre at 3:15 on Monday 3/12 for an informational meeting and first read through. 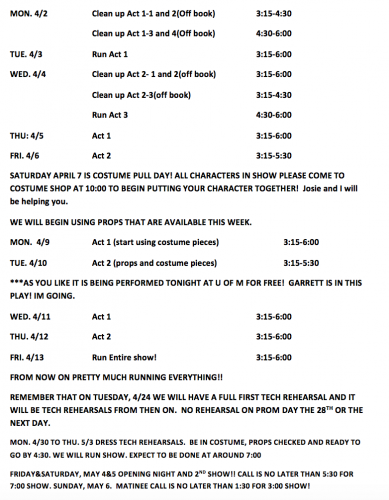 If you were not cast and are interested in helping the production on the technical crew please attend the tech crew informational meeting on Tuesday 3/13 at 3:15 in the choir room. 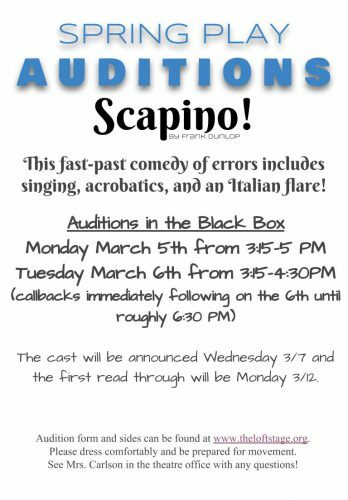 Auditions for the spring play, Scapino! by Frank Dunlop, are Monday and Tuesday, March 5-6th in the Black Box Theatre. This fast-past comedy of errors includes singing, acrobatics, and an Italian flare! 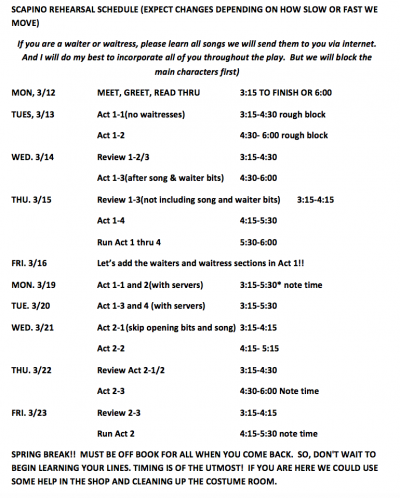 The cast will be announced Wednesday 3/7 and the first read through will be Monday 3/12. Please dress comfortably and be prepared for movement. See Mrs. Carlson in the theatre office with any questions! Here is the order of performances for Wednesday’s subsections tournament. Friends and Family are more than welcome to come. The admission is free for subsections. Results announced following the last play 7:30 p.m. There will be no bus back to East Ridge, but students are expected to return after to help unload the truck.